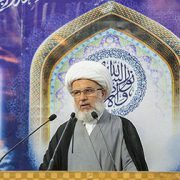 SHAFAQNA-Alkafeel: The Supreme Religious Authority thanked all those who contributed to the success of the Ziyarat Arba’een of Imam al-Hussayn (peace be upon him) in this year 1440 AH, and it stressed on the importance of seriously addressing the problem of the visitors’ transfer that is repeated every year. Praise be to God, the Ziyarat Arba’een has finished, and we ask the Almighty Allah the give the good reward and continuous steadfastness to all the visitors, and we are praying for their safe return, especially for those who came from outside Iraq and are still in Iraq. First, I would like to express my thanks and appreciation to the staff who worked during this Ziyarat. Many thanks to all bodies that harnessed all their efforts for the success of this Ziyarat. Before mentioning the Ziyarat data, I would like to refer to the beginning of a situation that is repeated every year, and the concerned parties must seriously consider finding a solution to the problem of transportation. Every Ziyarat season, we renew our call, as the roads leading to Karbala are not in compliance of the huge numbers of visitors, which requires serious thinking and realistic planning to draw entrances and exits to the city. As the main problem is not of busses or transport cars but is a problem of roads. And considering that this city is unique, solution must be found. We renew this demand every year, and I hope that those in responsibility positions to find radical solutions to the subject, as we must provide to the visitor the ease of entry and exit to the city. 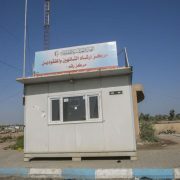 The first case is the state of generosity and goodness of the processions’ owners and the people of Iraq, especially that we know that a lot of people have poor financial situation, but this did not stop them to rush to provide what they can to the visitors from food, drinks, accommodation… This shows that there is a kind of awareness that the thrill of money is when spent, as it makes the person breaks the financial constraints that control the life. 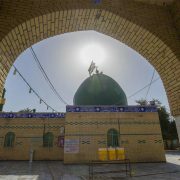 The Iraqis are known by the state of generosity and goodness that is a noble trait praised by the religion. The second point is the organization state, which draws attention in this momentum of millions of visitors, which presence did not disturb the movement of people without any case of accidents. In fact, the flow of these large numbers highlights the awareness of the officials in organizing the movement of the visitors and the service and condolence processions. And we hope that this level of organization lasts forever throughout the year. The other point is the presence of processions dedicating their service to cleaning and maintaining the public and private properties, which is a positive state in the presence of processions that provide food and drinks and accommodation. And we hope the continuation of such efforts to develop our services. There is also an important point I would like to highlight; This Ziyarat represents for everyone who witness it a very fine educational situation, in which one can find altruism, affection, generosity, helping each other, which is a state that is praised by all. This is part of our heritage, civilization and our awareness that should be documented. Everyone who participate in this march during ten or fifteen days, have to document the scenes they witness during their march, and we will take the responsibility of printing it. This journey to the Master of martyrs, includes wonderful scenes on the humanitarian and civilized levels, which must be written and recorded, such what have been done by some satellite channels and media, when broadcasting some of these scenes, to be a reason to inform others about the beauty of this journey and give others the motivation so they can join the caravan of Arba’een in the future. Many of the visitors can write their stories since the beginning of the journey until the return, which will definitely will be interesting. Finally, we are used to inform you about the final statistic of the number of the visitors. Before that, I would like to note that in the year 1438 AH, we had calculated the visitors’ number only on three main roads, and in the year 1439 AH, we did same on four main roads, and this year, the electronic counting system in the five main entrances (Baghdad – Karbala, Najaf – Karbala, Babylon – Karbala, Hussaynia – Karbala, and al-Hurr-Karbala.) We mentioned last year, we have put accurate cameras to count the visitors and cars, and we considered the minimum ratio for the transport vehicles, as for example, there are busses carrying more than 40 passengers and others for more than 80 passengers, we did not count these numbers, but we took the average vehicle rate which may carry from 5 to 15 passengers. So, this statistic does not reflect reality, because we cannot know the real facts. Therefore, we counted the minimum. The counting process started from the 7th to the 20th of Safar at midnight. I would like to also mention that in some cases, statistics are not accurate. 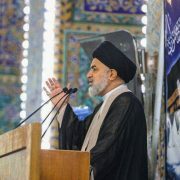 For example for the condolence ritual of Twayreej, even the modern equipment do not help us to count the participants in this ritual, because of the rush and speed of visitors entering from ever door of the holy shrine. This is not a known phenomenon in the world, as when we discussed this matter with the specialists in this field, they were surprised, as the modern cameras used in the statistics can only count people in every hour, but in such huge number of people, it is quite impossible. Therefore, some of them have promised us to work to find solution to give more accurate statistics. 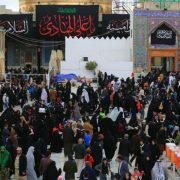 The statistics for the Ziyarat Arba’een are conducted with more ease, as the movement of the visitors is normal, and the cameras can count them without difficulty. in the year 1438 AH: 11.210.367 visitors, in the year 1439 AH was 13.874.818 visitors, and in this year, the counting process stopped at midnight in the five main entrances of the city, and the number of visitors was 15.322.949 visitors, including more than 2 million visitors from outside Iraq, with the participation of 10.714 service processions and 225 bodies from 25 countries. We ask the Almighty Allah to grant us success, to accept from all of us the good deeds and to bestow the good upon the countries of Muslims. And, the latest of our prayers is; praise be to Allah, Lord of the Worlds, and Prayers and Allah’s Peace be upon Mohammad and his pure and virtuous lineage.